This week's raid on the Palmer Building in Hollywood — former home to comedy improv theater iO West — initially made headlines as a drug and gun bust. 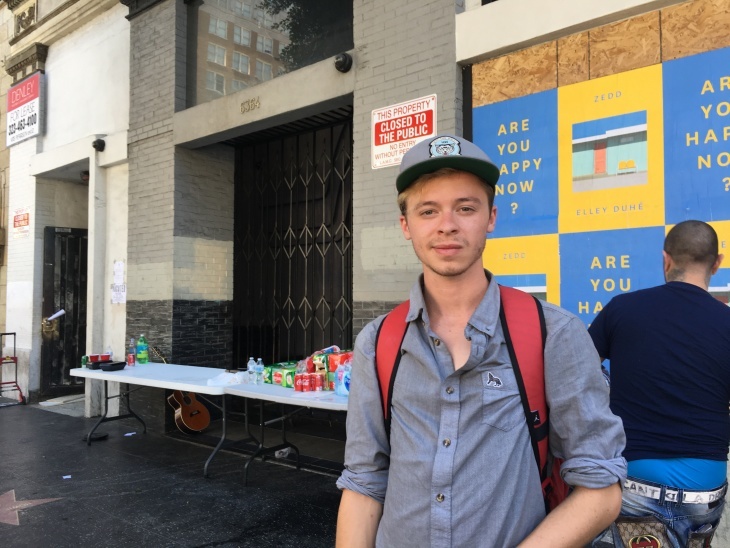 But it turns out the story's more complex than that — and offers a snapshot of how LA's high rents force some to seek out unconventional living arrangements, often in marginal or illegal buildings, which can also be dangerous. Wednesday's raid was conducted by a City Attorney's task force, that was formed to target commercial and industrial spaces illegally converted to dwellings. It was inspired by the fatal 2016 Ghost Ship warehouse fire in Oakland, which killed 36 people. We've taken a closer look at the story behind the four-story commercial building at Hollywood Blvd. and Cosmo Street — and what happened during the raid. Holden Rifat said he awoke early Wednesday by a cop in a SWAT outfit aiming a weapon at him. "I awoke at 4 o'clock in the morning to 100 , 120 SWAT members," Rifat said. "No warning whatever, they just they came in with guns armed. I had some lasers pointed at my chest which was not cool." Rifat had lived there for a couple of months. A videographer and music video editor, he's lived all over Southern California, but wanted to be in Hollywood, center of the entertainment industry. His third floor, two-room space, about 900 square feet cost $500 cash a month, and he shared it with a roommate. The bathrooms were down the hall. 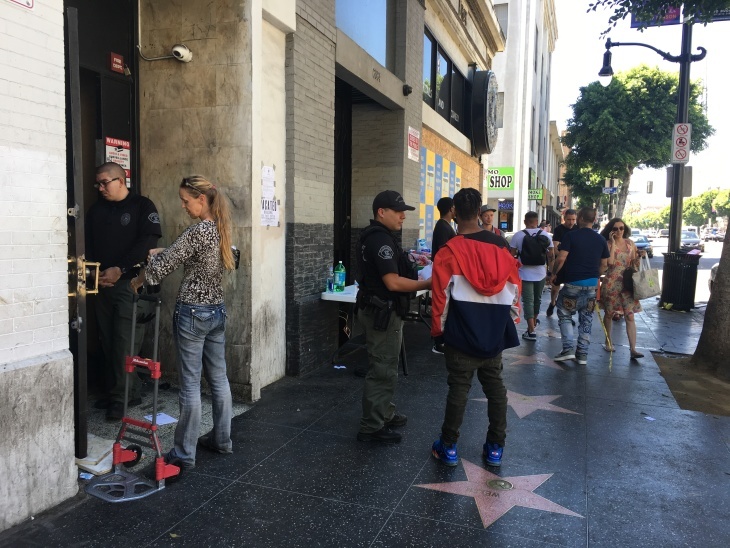 As we talked outside the building, other residents grabbed takeout containers of food from a table set up on the sidewalk that is part of the Hollywood Walk of Fame. The food was sent by building owner Denley Investment and Management Co., according to fliers on the table. Rifat and the other displaced residents were barred by security guards from going inside for their property. Paid movers were packing up their rooms and bringing their goods down in boxes. And Rifat was annoyed that some of his property - some good cameras - had been damaged in the process. Its formal name is "The Palmer Building," erected in 1921 at the corner of Hollywood Blvd. and Cosmo Street. The Palmer name has historic resonance; The Hollywood and Vine intersection was developed by the Palmer and Taft families. It's a four-story reinforced concrete building, with an additional structure extending to a fifth floor. It's close to the Pantages, and Hollywood and Vine. It's close enough to the tourist center of Hollywood that there are stars embedded in the Walk of Fame — June Lockhart, Howie Mandel, Rodney Dangerfield, Paul Henreid (from Casablanca) a few others. The Palmer Building at the corner of Hollywood Blvd. and Cosmo Street. The Palmer Building is among more than 100 buildings constructed between 1915 to 1935 in a 12-block area, described as "the main street of the film capital of the world," that were nominated for inclusion on the National Register of Historic Places. The Palmer Building started out with a newspaper office on the ground floor. Over the years, it has consistently been a commercial office building in the upper floors. In 2001, the ground floor restaurant was converted to a bar and theater, and for the past decade, housed comedy improv theater iO West. The owners of iO West ceased operations early this year. Business tenant Tony Frank had rented space on the fourth floor for a music production company, Red Rocket Media. He and a few other business tenants who held leases saw the building begin to empty out.
" We've seen the building go from halfway full to zero," he said. We didn't know what was happening—The owner was refusing to fix a lot of things. So a lot of legitimate tenants started moving out. So then during that problem he hired a third party company to come in and manage the building"
Building owners Mehdi Bolour, Palmer Building Associates LLC and Bolour's company Denley Investment and Management Company and his attorney did not respond to calls seeking information about the building's condition. Over time, different people came in representing themselves as the managers to collect the rent. It's unclear if the owner received some or all of the money the managers were collecting. In January, the raids started, Frank said. Three times since January, police have come in to force out anybody who didn't have a lease. Tony Frank would show his lease and was allowed to remain each time. In the intervening months, the owner seemed to lose control over who had access to the building, he said. "And all of a sudden they're there seeing people opening up office doors who are not supposed to be there. We called the owner no response no call no return call everything else. And it's getting worse and worse," Frank said. Periodically, there were interruptions in the electrical power to the tenants, and other occupants would replace fuses that were removed. The water would be cut off and then restored, Frank said. In June, the Building and Safety office referred the complaints to the City Attorney's office and charges were filed last week. In the final raid, early Wednesday, police entered the building and handcuffed the occupants and took them to a police station. Even Tony Frank, and his service dog were taken. "All of a sudden I'm like I'm in the back of a truck. Handcuffed," Frank said. The police recognized him as a lease-holding tenant from an earlier raid, and he said they apologetically told him, "You know we just got to run your I.D. make sure you don't have a warrant. And then they let us go." Frank said some residents who did not have leases were cited for trespassing. Thursday afternoon, he was loading his business property into a truck to take them away to his home elsewhere. Meanwhile the building was being boarded over. The Palmer Building raid is one example of the kinds of prosecutions inspired by the fatal Ghost Ship fire in 2016. A warehouse that had been illegally converted into substandard crowded residential units burned, killing 36 people, many of whom were trapped inside. Following the Ghost Ship Fire, City Attorney Mike Feuer created a Task Force to concentrate on commercial properties that were being used for non-permitted residency and had other public safety issues, said his spokesman Rob Wilcox. Public records from the Building and Safety Department and the City Attorney show a year-long string of complaints and inspections that led to the order to vacate the building. It's unclear from the record who made the complaints. In August 2017, the complaints to Building and Safety Department code enforcement officers began. The violations found over the following months included failure to comply with a valid department order to seal the building, unapproved use of the basement as living spaces, music studios and a barbershop. The building had unapproved construction and illegal occupancy, unapproved partitions in the basement and electrical work had been done without permits. In June, Building and Safety referred the complaints to the City Attorney's office for action. 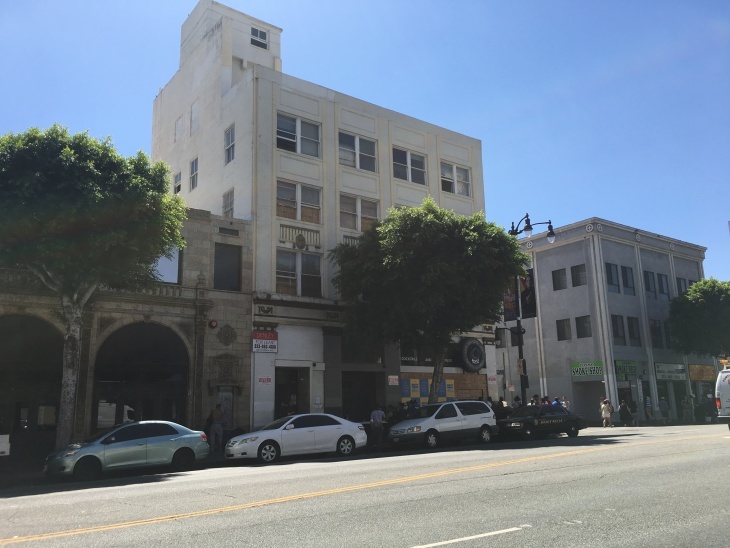 Last week, the City Attorney's office filed a 25-count criminal case against Mehdi Bolour, owner of a commercial building at 6360 Hollywood Blvd. The charges allege various building and fire code violations. The enforcement action taken Sept. 12 could bring additional counts, a spokesman for the City Attorney said. The Task Force is comprised of the City Attorney, LAPD, LAFD and Building and Safety. Wilcox said the task force pursued a number of those cases, many similar to the Hollywood Blvd. case. There is no automatic outreach to residents who are displaced in a mass eviction, said Teresa Campos, spokeswoman for the Los Angeles Housing and Community Investment Department. The enforcement was under the radar, she said, so they did not know to go in beforehand to contact residents. None of the residents had reached out to the department for help as of Thursday and the department had not reached out yet to residents, she said. So the people who were living there, either rent-free as squatters, or paying under-market rent to managers who may or may not have been there with the permission of the owner - those residents are pretty much on their own. They can reach out to the city, but it's unclear what help they might get.